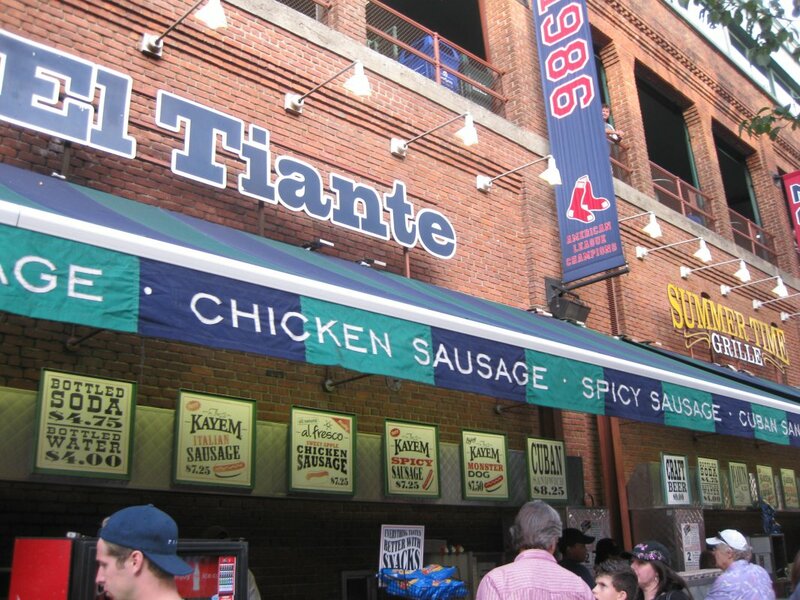 It’s hard to find a compliment that hasn’t already been said about Fenway Park. 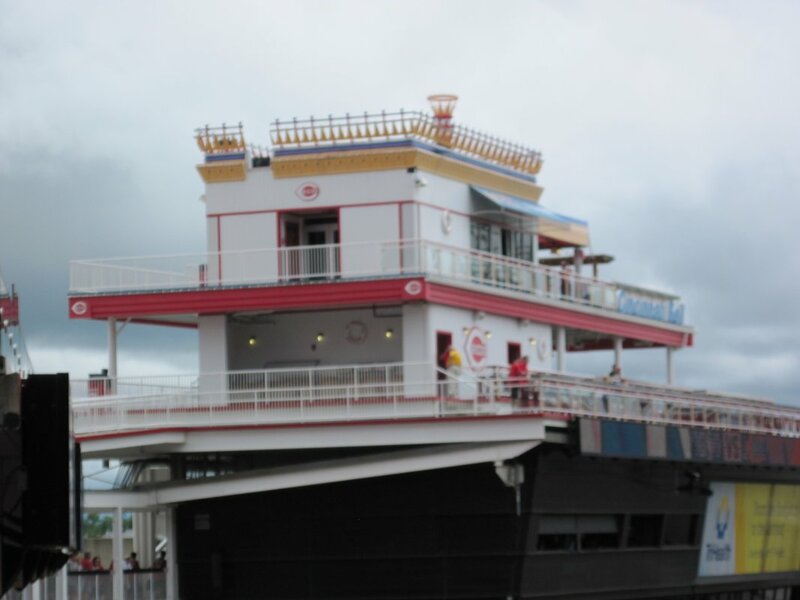 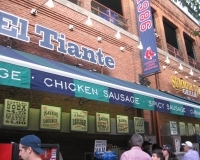 I mean, the place has been around for more than 100 years and is still standing, despite plenty of chatter over the years about replacing it, so it must be doing something right. 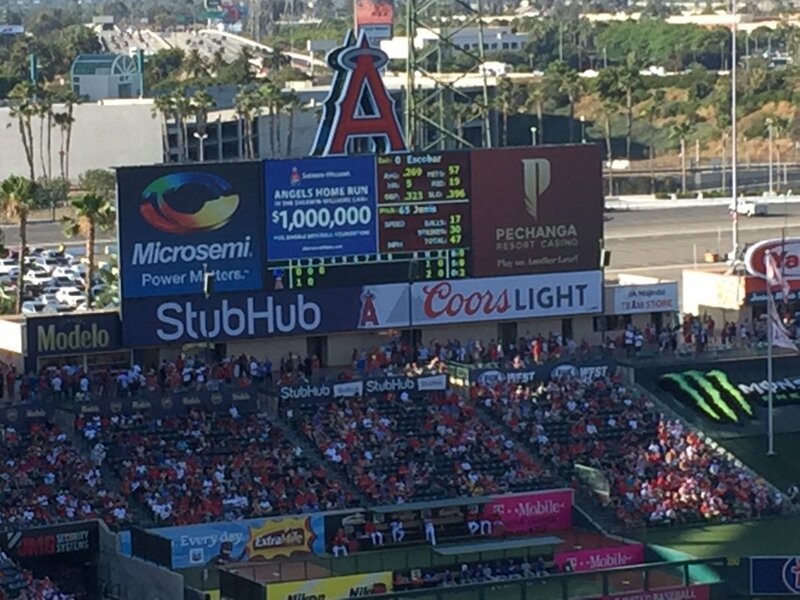 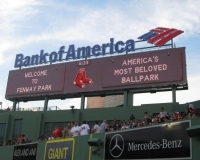 And if it can greet visitors with the message on the scoreboard that it’s “America’s Most Beloved Ballpark” and receive nary a scoff from even the most jaded or cynical baseball fan, then it must REALLY be doing something right. 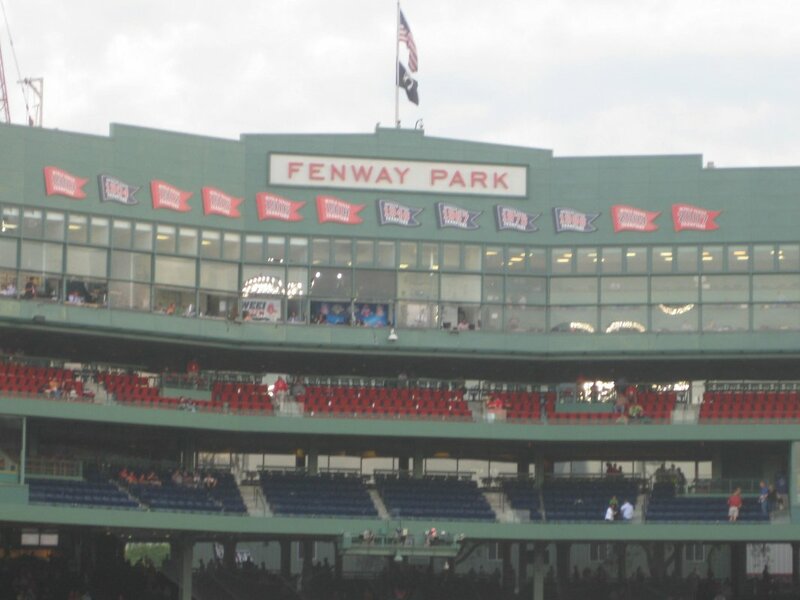 Yes, there’s just something about Fenway Park. 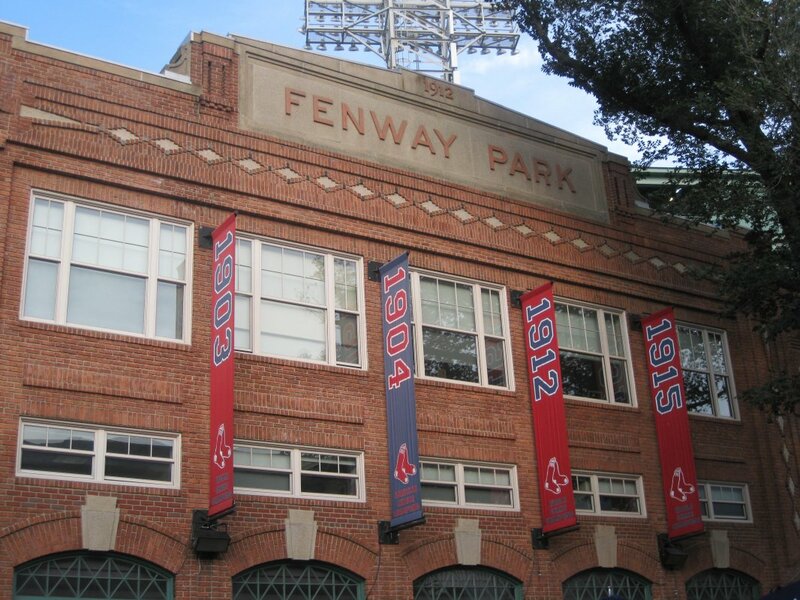 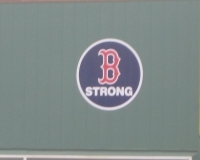 It’s an old facility, for sure, and it shows its age if you look hard enough, but quite frankly, its age is part of its charm, and the Red Sox do an unbelievable job using the age factor to its advantage. 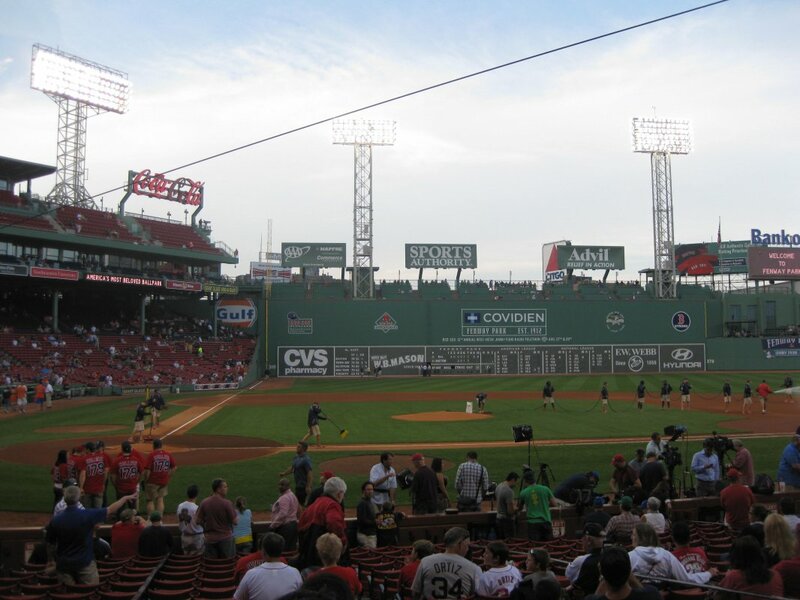 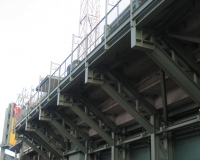 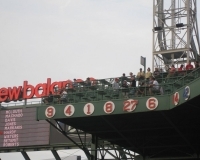 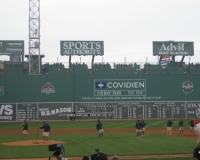 Attending a Red Sox game is a little like being transported to the days of nickel trolleys and “base-ball to-day” — only you get all the modern perks you expect out of being a fan at a major-league game. 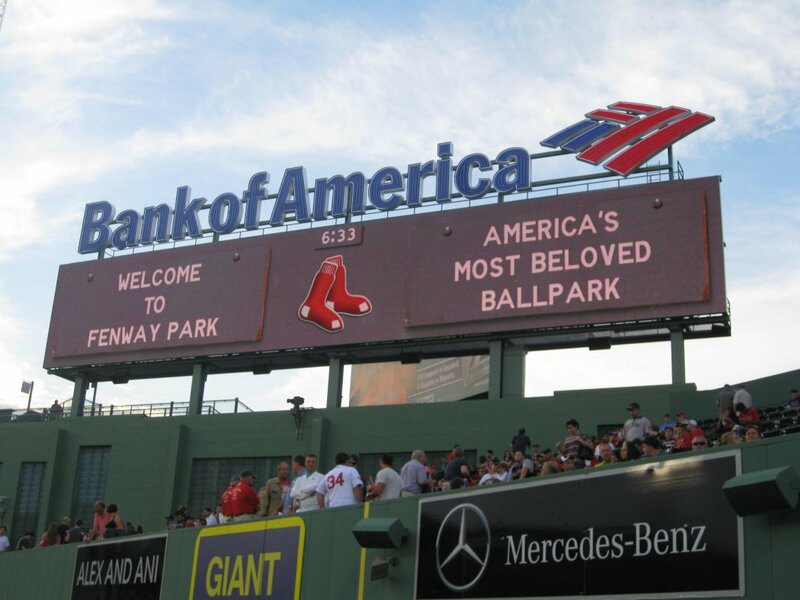 In other words, you get the best of both worlds, but that’s only one of the many reasons why this ballpark is worthy of being beloved. 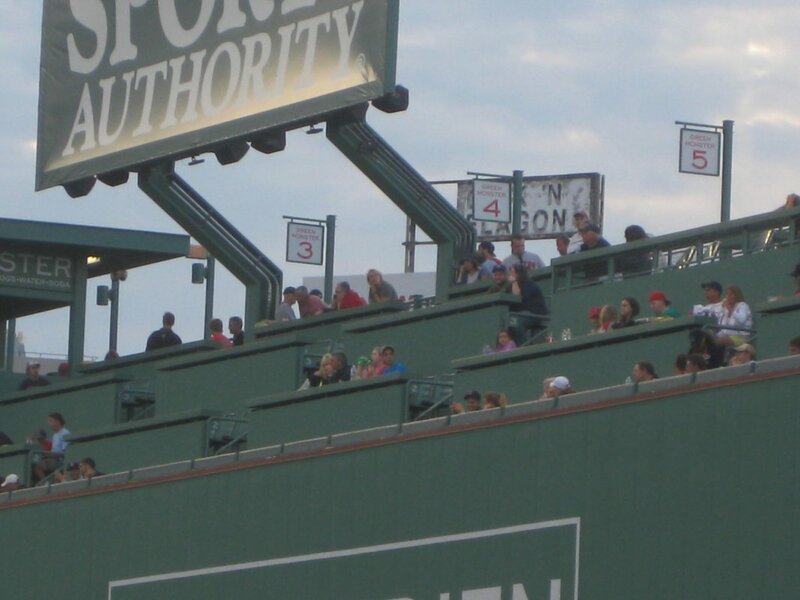 Or you could just look at someone like Mrs. 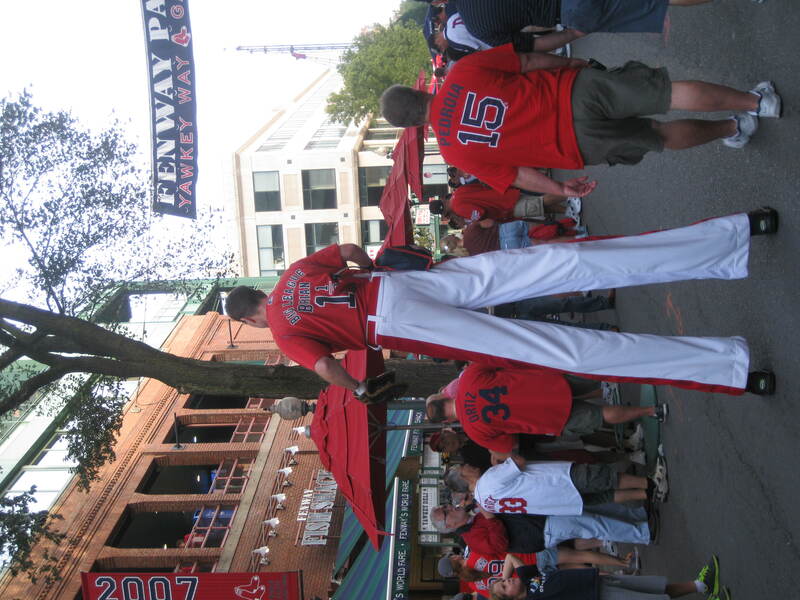 Fan, who was absolutely giddy to be stepping inside Fenway for the first time when we took in a late-summer affair. 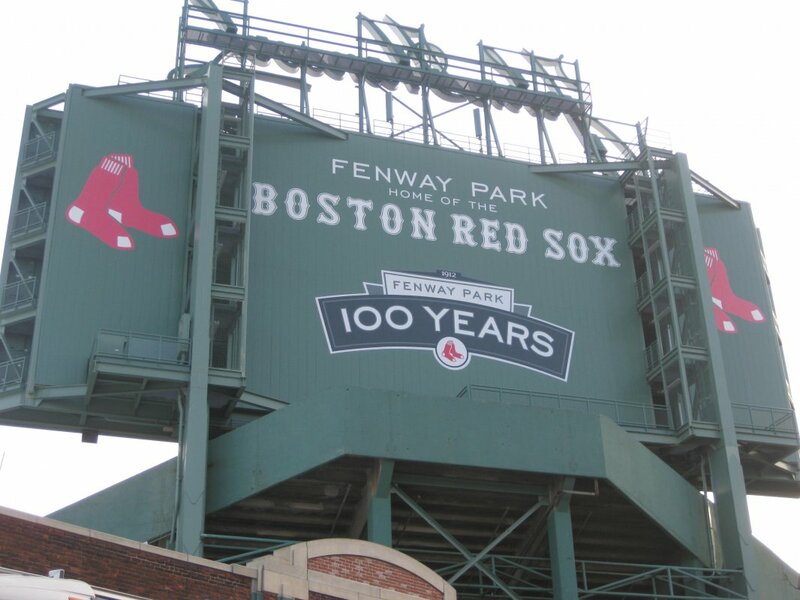 She’s not a Red Sox fan, but a huge fan of Boston, a huge fan of ballparks, and a huge fan of history. 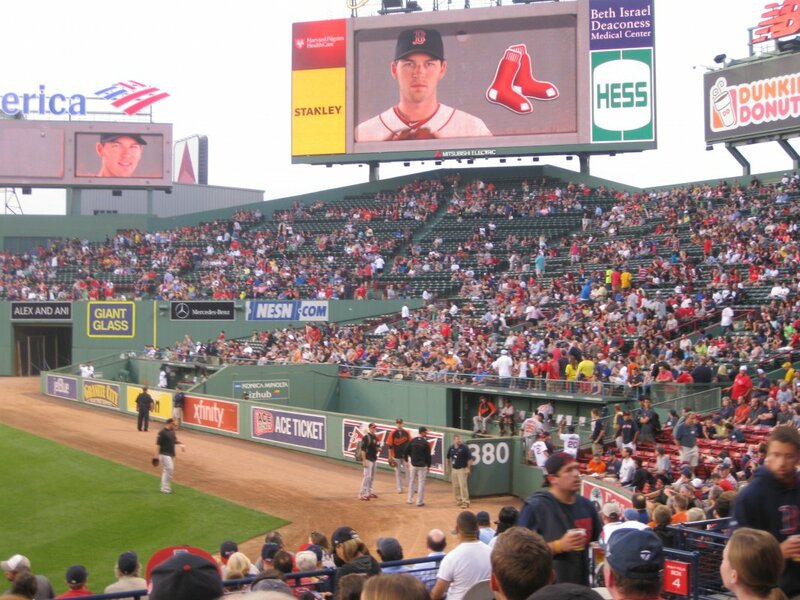 Sounds like someone for whom Fenway is tailor-made. 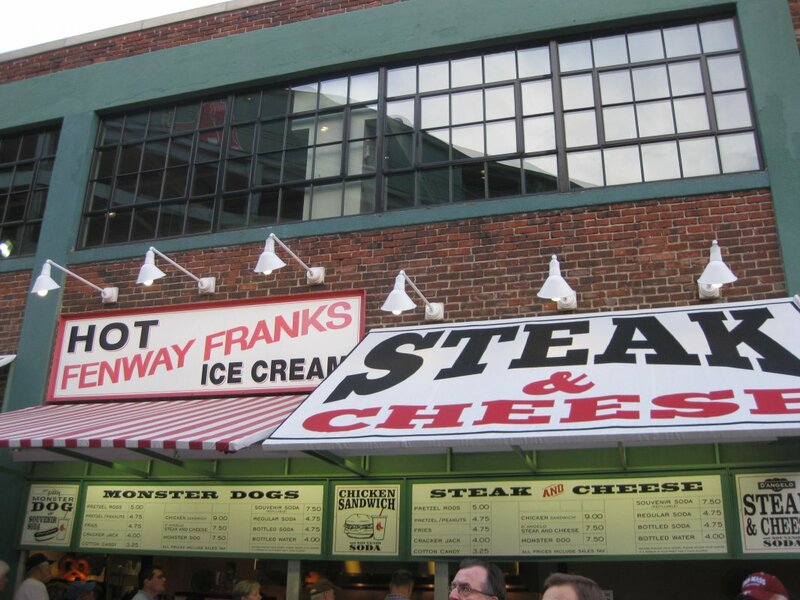 For more on visiting Boston, check out our Boston city guide. 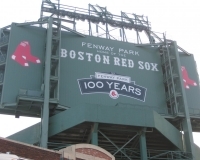 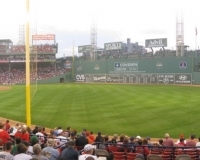 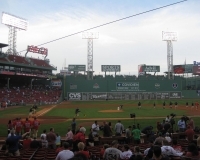 Fenway Park sits in a prominent spot in the city of Boston, with the Massachusetts Turnpike (aka Interstate 90, aka “Mass Pike” to locals) running just on the other side of the Green Monster, and major streets, subway lines and train lines all very close by. 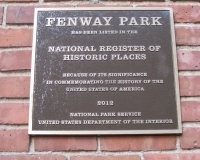 The popular and bustling Back Bay section of town is within walking distance, separated from Fenway by a swath of parkland/swampland called the Back Bay Fens (which is what gives the Fenway neighborhood its name, and which in turn gives Fenway Park its name). 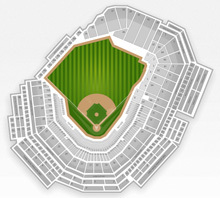 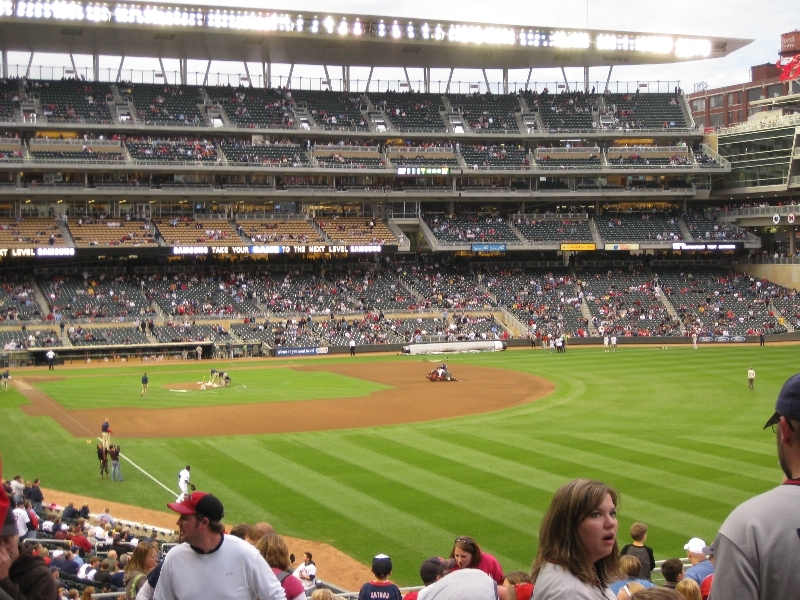 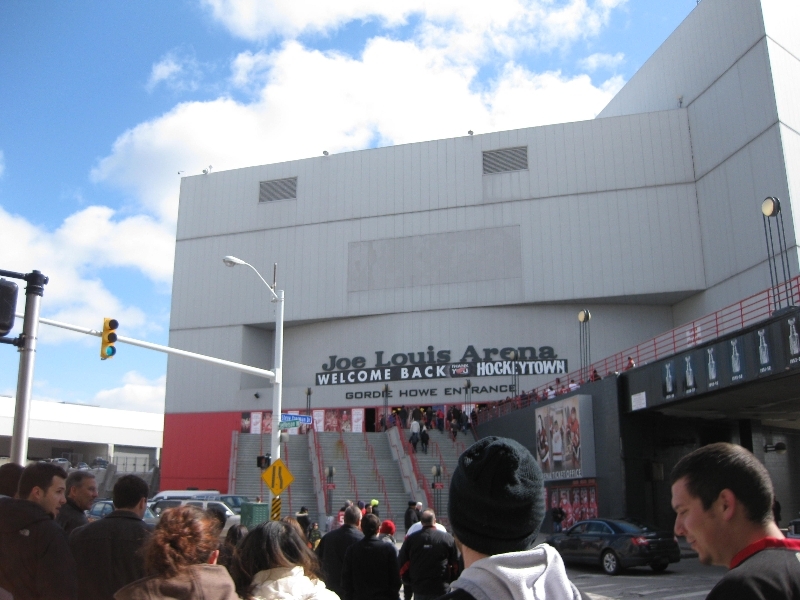 But whether by foot, car or train, the ballpark is easily accessible. 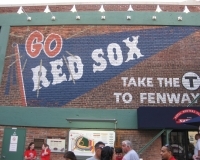 Having driven from Connecticut for a day-long sojourn at the end of a business trip, we hopped on the Green Line of the subway (known locally as the T) and rode it into town, passing by Kenmore, the closest stop to Fenway. 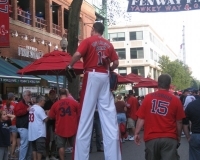 We spent the afternoon cavorting around the North End and Back Bay, so when it came time to head to the game, we chose to walk from Back Bay, a 15- to 20-minute journey. 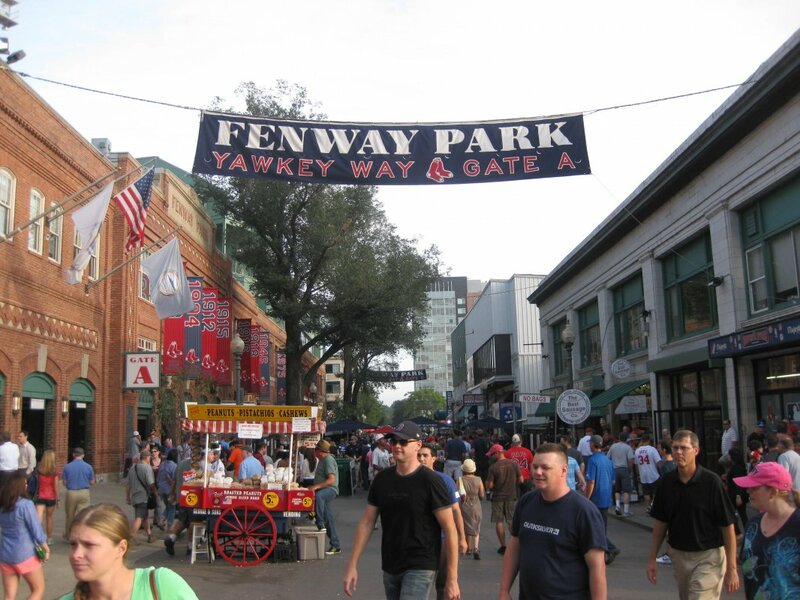 And it’s a rather pleasant walk, as long as you know where you’re going — and with Boston’s streets, that can be a bit of a challenge. 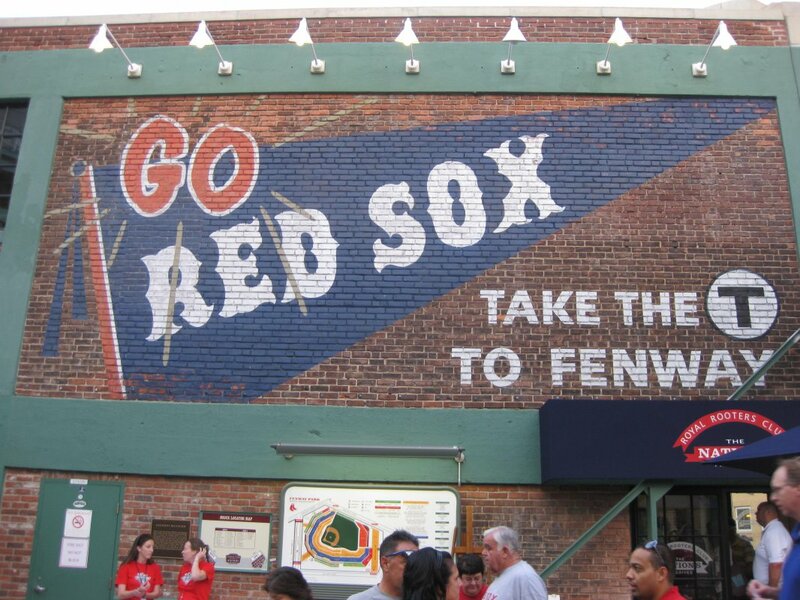 Refer to a map, of course, but in general, don’t assume that a major thoroughfare like Boylston Street will lead you directly to Fenway. 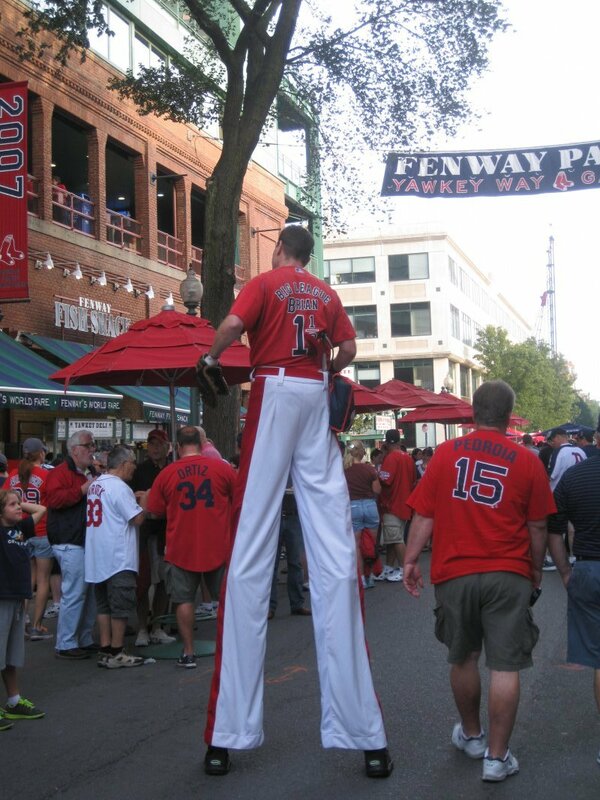 If you’re walking west, for example, the more out-of-the-way Ipswich Street is a better route, as we discovered. 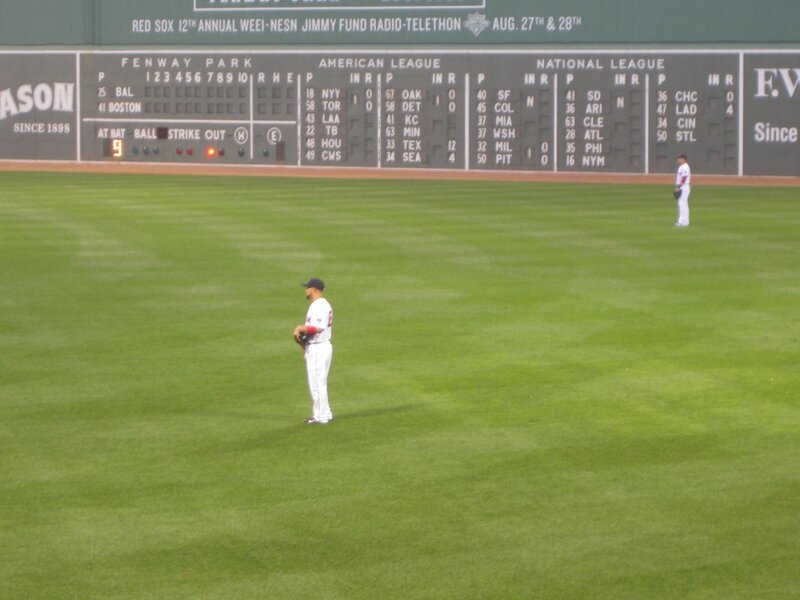 When in doubt, find a cluster of Sox fans — trust me, one won’t be hard to find — and just follow them. 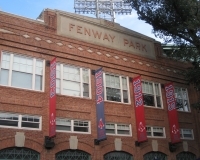 The Massachusetts Bay Transportation Authority (MBTA) also operates a commuter rail system, the Framingham-Worcester line of which has a Yawkey stop right outside the ballpark. 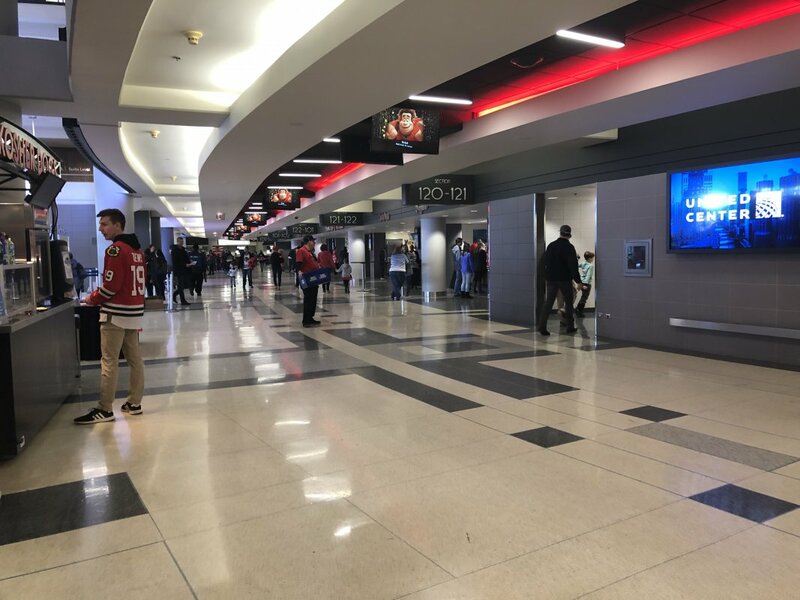 It’s a good option if you’re coming from well outside the city, though schedules are more limited (in late evenings, trains leave about every 60-90 minutes). 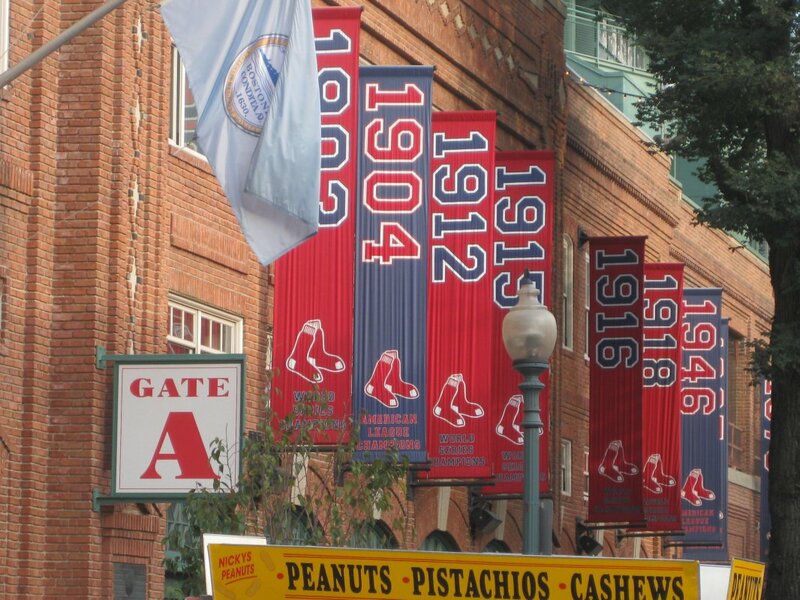 The streets surrounding Fenway are definitely something to experience as game time approaches. 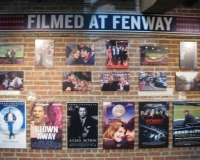 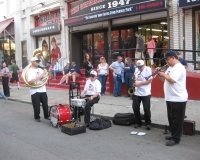 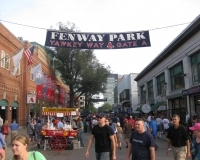 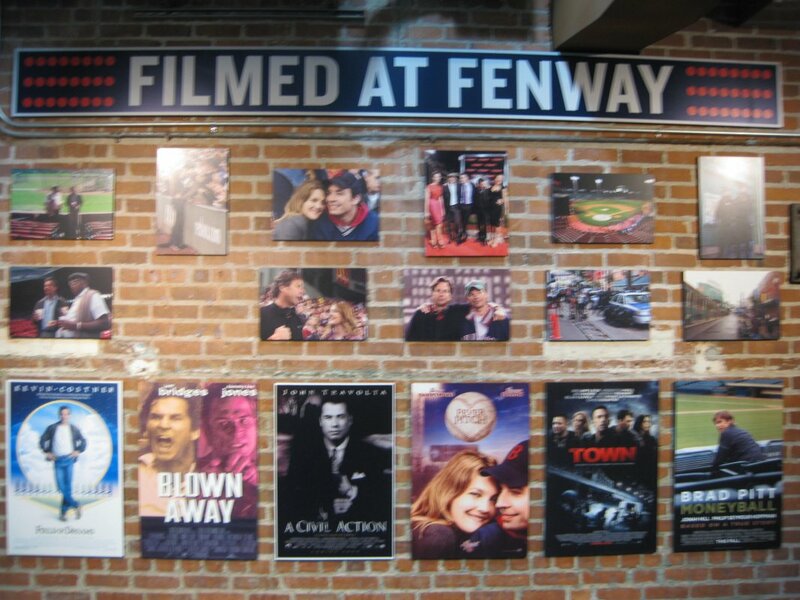 There are things to do and places to eat, drink and people-watch all around, but if you’re a first-time visitor, do reserve time for strolls down Landsdowne Street (behind the Green Monster) and especially Jersey Street (formerly known as Yawkey Way), where the ballpark’s main entrance is. 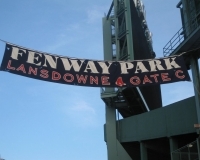 In fact, ballpark turnstiles are on Jersey Street, which means that by joining the festivities there, you’re actually entering the park, so be sure you’re committed to going in before you head down that way. 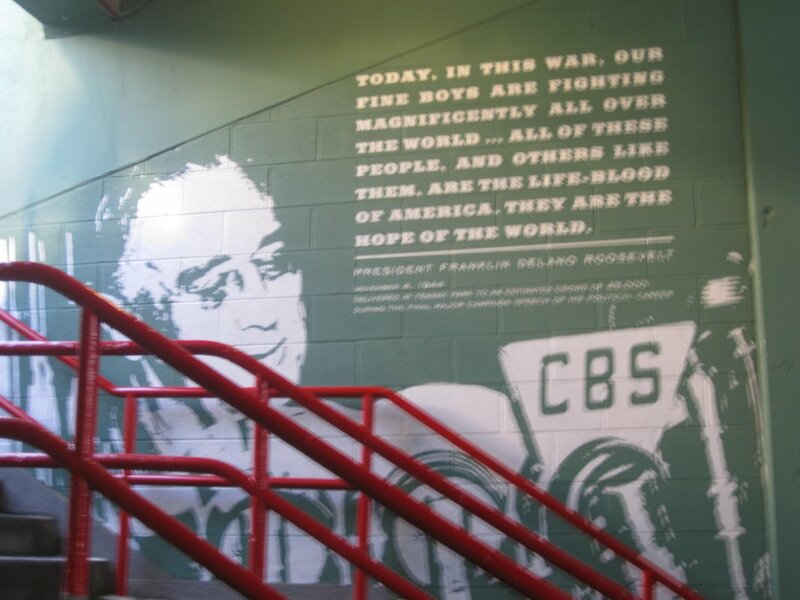 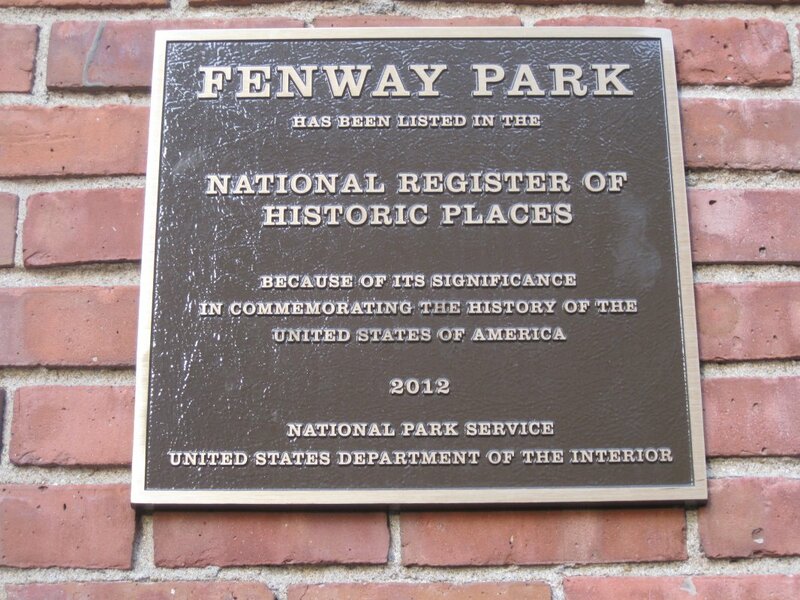 But to us, Jersey Street epitomizes the Fenway experience. 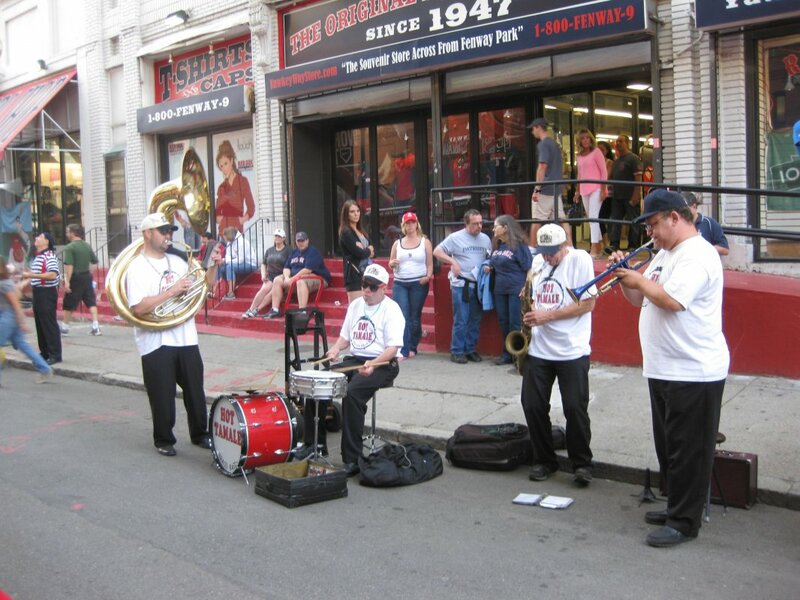 Closed to vehicles on game days, the street is full of activity, and the Red Sox have given it a fair-like atmosphere with concession stands, picnic tables and performers such as a guy on stilts (I’m sure there’s a better way to describe him than that) and a band playing old-timey music (if you’ve ever watched any of Ken Burns’ “Baseball,” you’ll have an idea of how they sound). 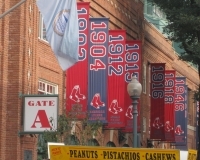 The only way they could’ve made it feel more authentically like 1912 is if there were streetcars to dodge and trash everywhere. 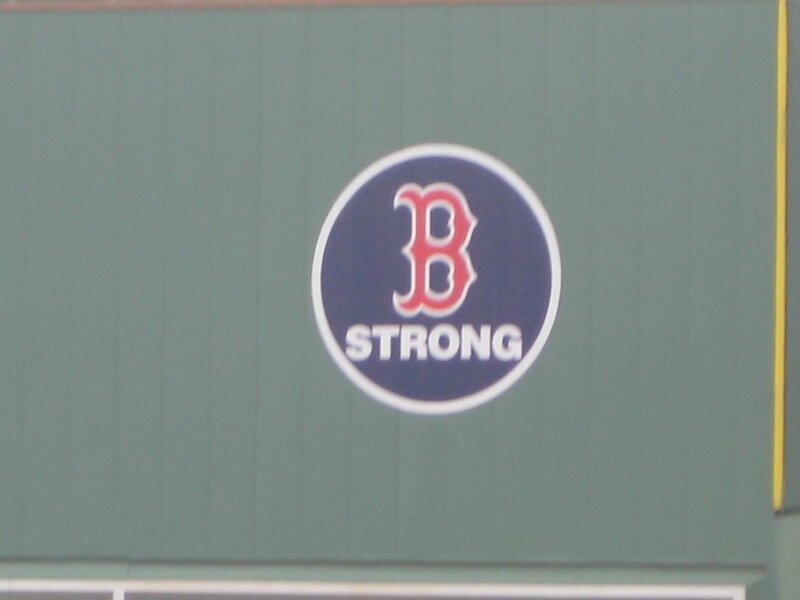 We spent a good 45 minutes around these areas, taking pictures and soaking in the scene, before heading inside. 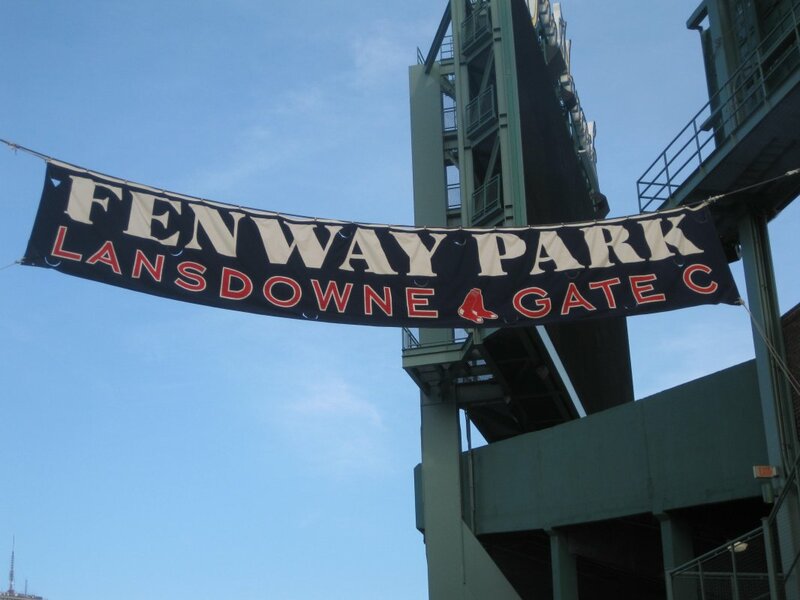 It goes without saying that you’d want to walk around to experience any ballpark you’ve never visited, but if it’s Fenway, this is a must. 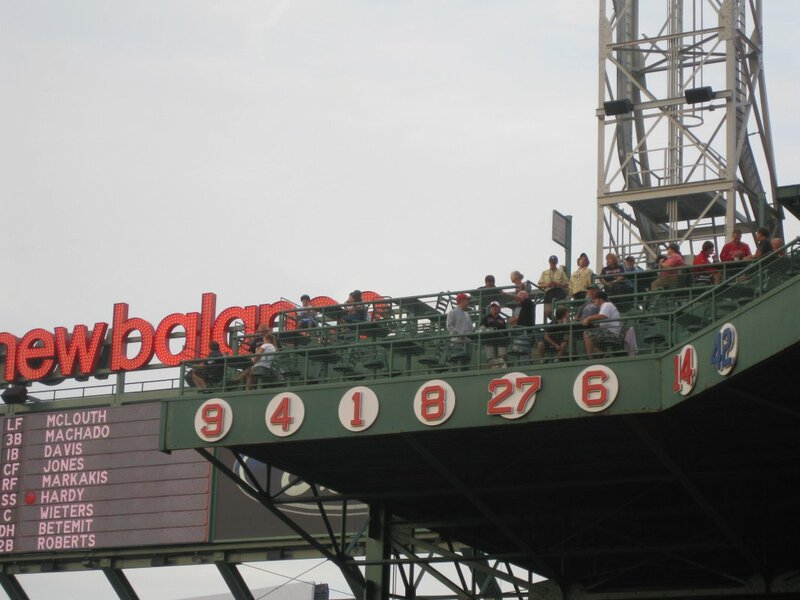 There is just so much to look at that you owe yourself the time to walk around and soak in the atmosphere. 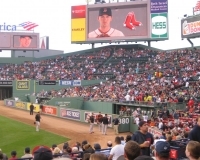 Fenway is very accommodating in this regard — it is much like Wrigley Field in that you see a lot of fans there who are quite obviously there for the experience, and the die-hard Red Sox fans in the crowd don’t just tolerate them, they seem to welcome them. 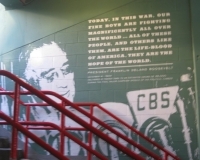 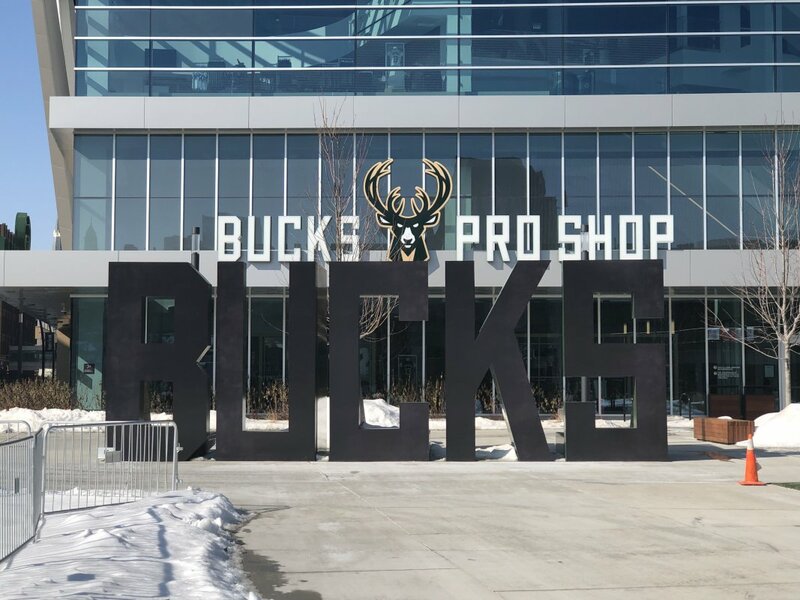 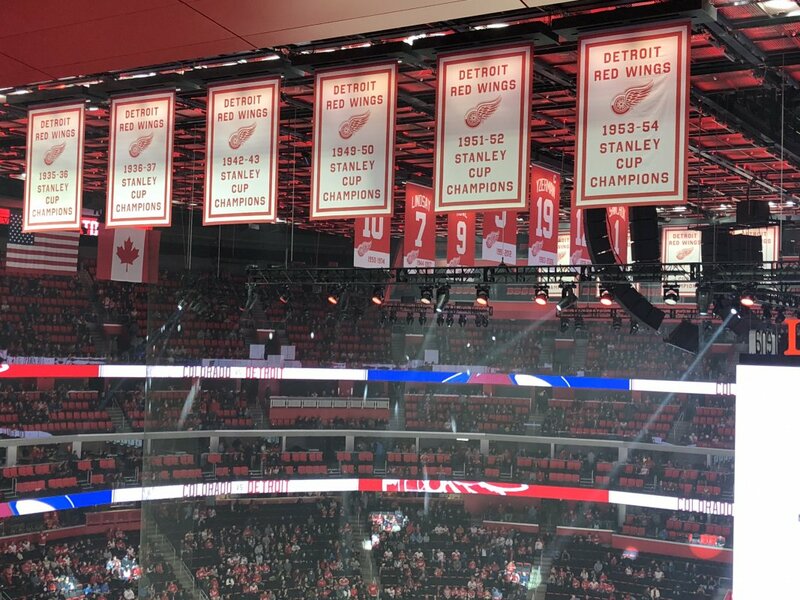 At an old facility, you half-expect to walk in and find really outdated amenities, and at some stadiums that bears out. 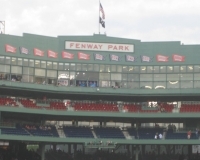 Fenway, though, has nice, roomy bathrooms (at least the ones I used) with non-flush urinals, a fairly wide concourse and expansive picnic and gathering areas. 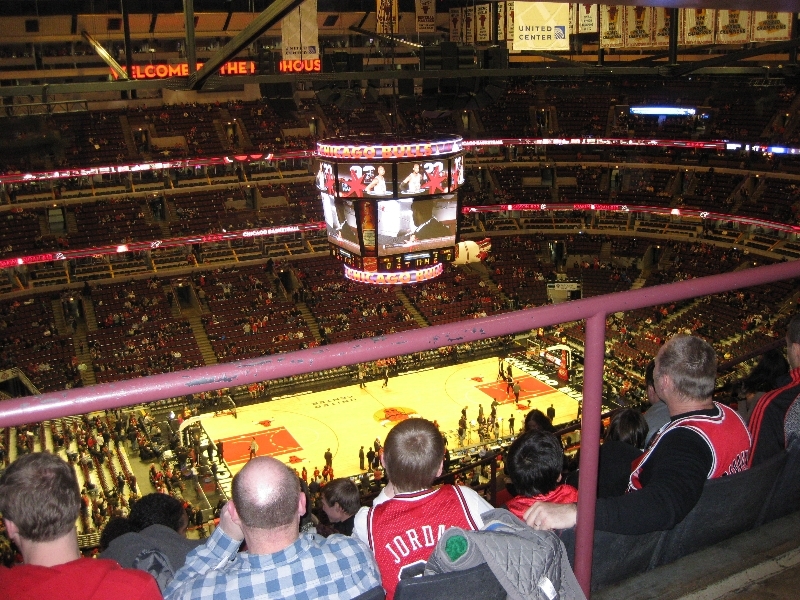 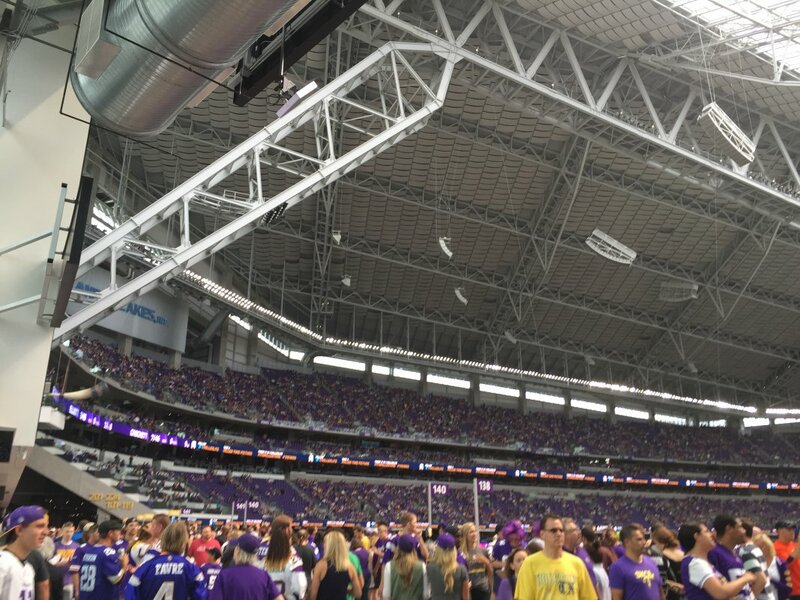 If you’ve heard that the seats and aisles are narrower than usual, you’re right — they do feel a bit like you’re crammed in the middle seat on an airplane, but I suppose that contributes to the communal atmosphere. 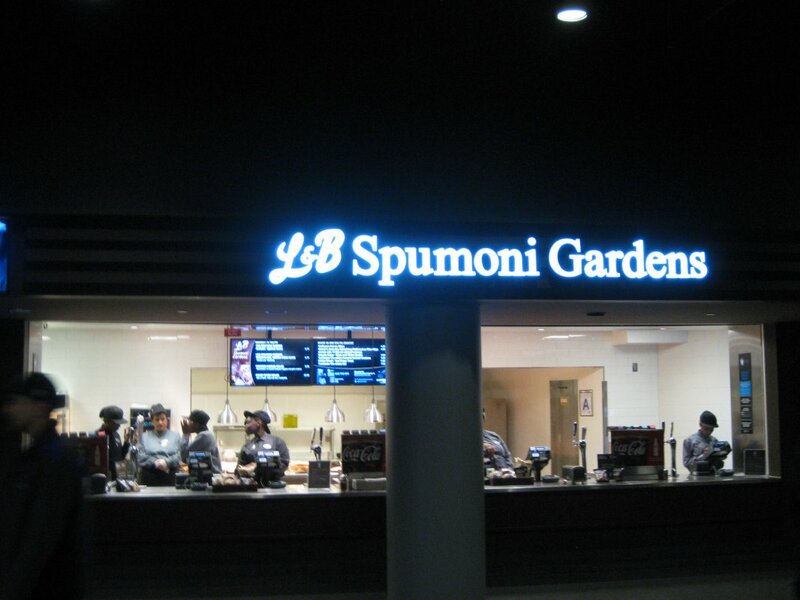 Meanwhile, the food wasn’t spectacular in my view, but there was some good variety. 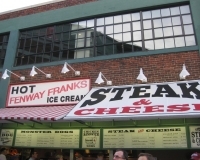 Despite not being much of a hot dog guy, I bought a Fenway Frank (pretty good), and later we went in on some fried dough (just OK, but being able to add your own powdered sugar and cinnamon was a plus). 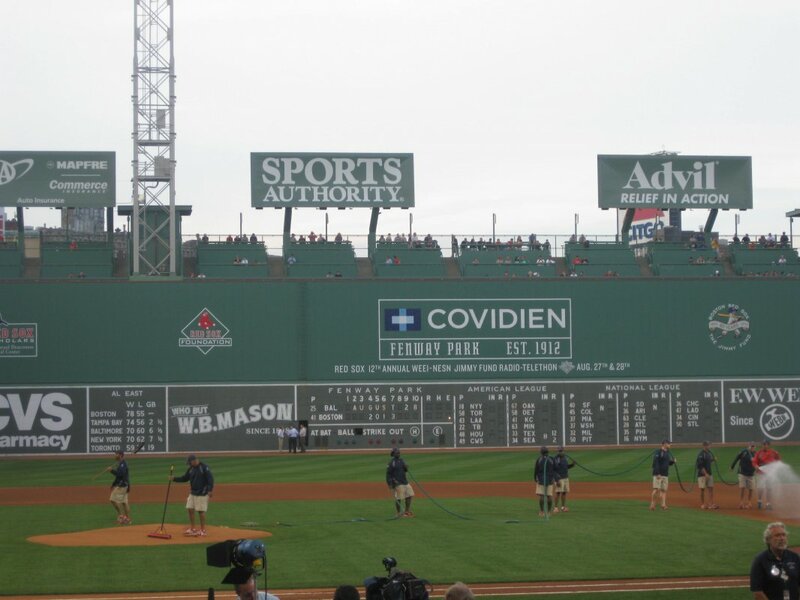 Our seats were down the right-field line, right by the Pesky Pole. 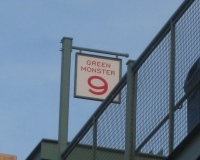 We had a terrific view of the Green Monster and of the bullpens beyond the right-field fence, but home plate was at 10 o’clock to us if we sat straight in our seats — another drawback of the park’s age, as sight lines aren’t the best and poles and overhangs could easily block your view of the action depending on where you’re sitting. 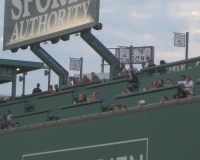 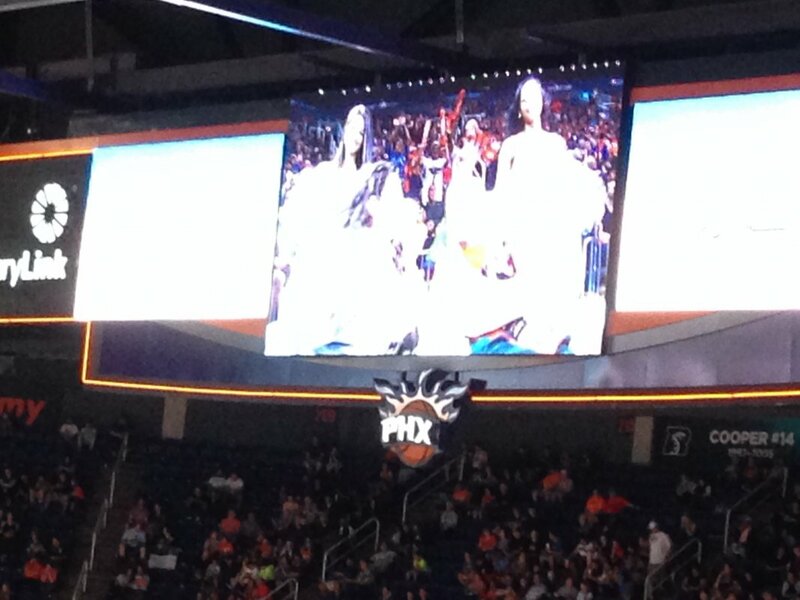 If your view is really that compromised, you can just watch the game on the HD scoreboards, one of the amenities that doesn’t seem to fit in a 100-year-old ballpark but after a while you’re glad it’s there. 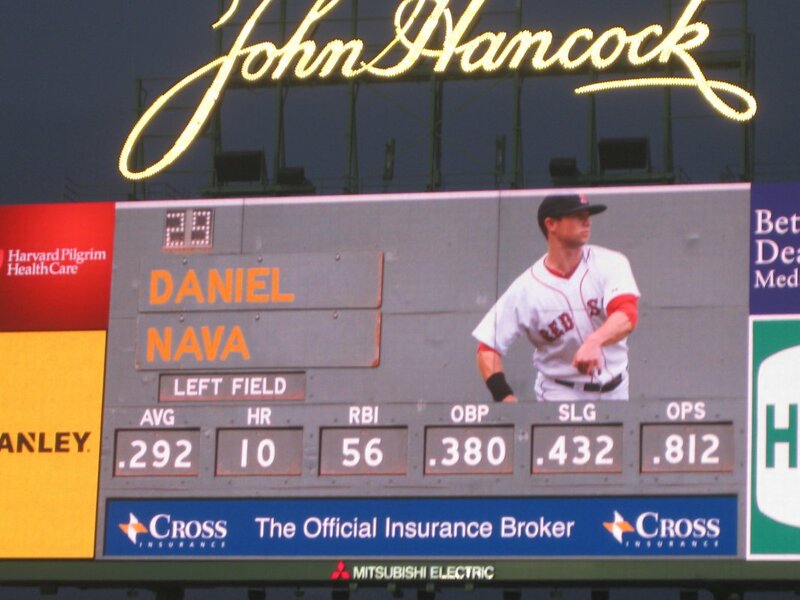 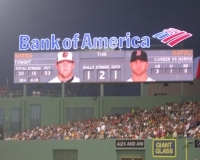 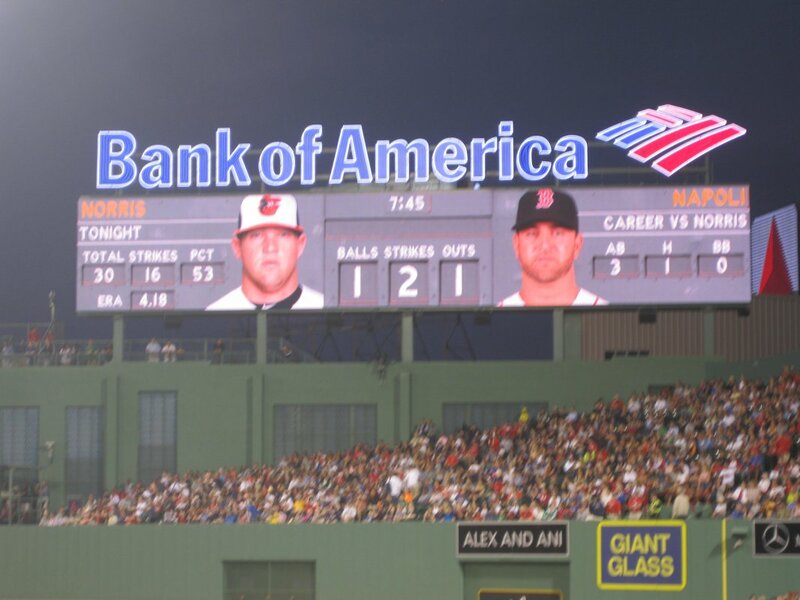 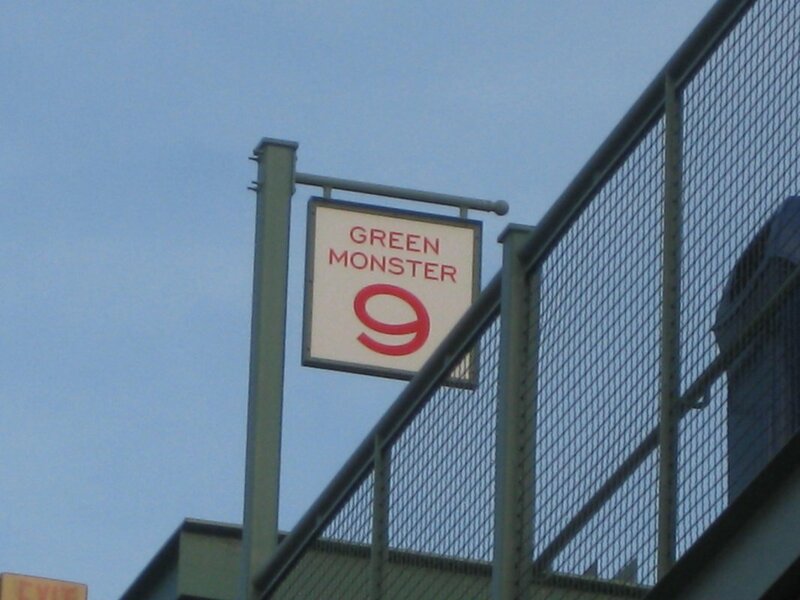 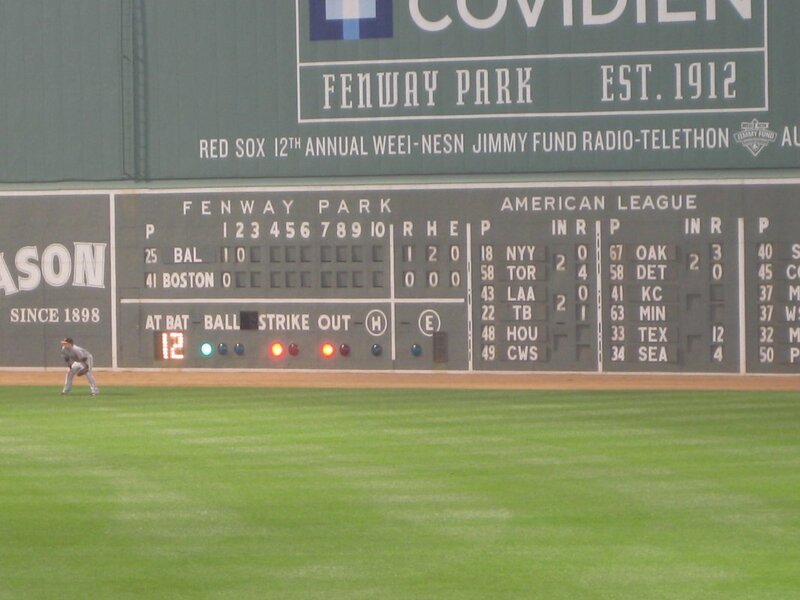 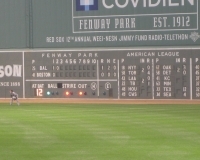 And the displays that mimic the hand-operated scoreboard on the Green Monster are a nice touch.